Estadio Olímpico Universitario officially opened on 20 November 1952. The first match, an American football match, was played nine days later. Estadio Olimpico Universitario was the centrepiece of the 1968 Olympics, hosting the opening and closing ceremonies, and the athletic events. The stadium was one of the playing venues of the 1986 World Cup. It hosted three group match and the round of 16 match between Italy and France (0-2). It could host about 68,000 spectators at that time. Over the years, capacity of the stadium got gradually reduced due to safety measures and refurbishments, first to around 63,000 during most of the 2000s and more recently to 52,000 seats. The eastern side of the stadium holds a mural of Diego Rivera, who had planned to cover the complete outside of the stadium with murals, but never got to finish his work due to his death in 1957. Estadio Olimpico Universitario is part of a complex of UNAM university buildings that has been given World Heritage status. Estadio Olímpico Universitario is located in the south-west of Mexico City, approximately 14 kilometres from its historic centre. It is part of the main campus of the UNAM university, Mexico’s largest university. The stadium can be reached by car following the Avenida Insurgentes Sur, one of the city’s principal avenues. Follow the avenue south until the stadium appears on the right. If using public transport, you can reach the stadium by either metrobus or metro, with the former the most convenient option. The metrobus is the city’s fixed-lane bright red bus system. Line 1 runs all the way down Avenida Insurgentes and can be boarded around Avenida Reforma, or at several stops in the Zona Rosa and Condesa areas. Take the bus in southern direction and get off at stop Dr. Galvez. From there it is a 5 to 10-minute walk slightly uphill following Insurgentes. Alternatively, you can take metro line 3 to station Copilco, find your way to the UNAM university campus, and cross the campus to the stadium. The walk will take about 25 minutes. Tickets for Pumas matches can be bought online via Ticketmaster, or through one of the Ticketmaster sales outlets. Tickets are also available on the gate on the day of the match. Pumas very rarely sell out. Prices depend on the opponent, but will typically range from MXN 140.00 for a seat behind the goal to MXN 230.00 for the lower parts of the long sides. Prices increase to between MXN 180.00 and MXN 290.00 for high-profile matches. Clubpumasunam.com – Official website of the Pumas UNAM. Metrobus.df.gob.mx – Website of the Metrobus transport system. 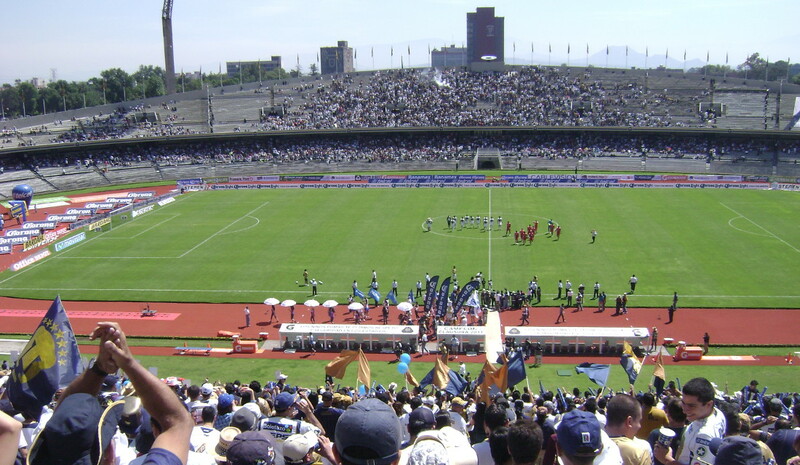 In September 2011 we visited a match of the PUMAS, one of the most popular teams of Mexico, and at that time reigning champions of Mexico (though they were just going through a rather bad spell). They typically play their matches at noon on Sundays, which means that many people arrive with their hair still wet of showering. We got to the the stadium easily by Metrobus. Finding the right stop wasn’t hard as it just meant following the crowds in PUMAS gear get off and walk to the stadium. After having arrived at the stadium the taquillas (ticket booths) were easily located, though the scene was slightly confusing as each window was assigned to a particular part of the stadium and there wasn’t any map with the layout of the stadium around. However people were friendly enough to help us out identifying the different parts. It took us about 15 minutes queuing before we arrived at the front of the line and a further 10 minutes going through security checks and locating our seats. So better not arrive at the last minute. It’s not allowed to carry any belts inside the stadium. Even though there is special service to guard your belt during the match – which is in fact reliable – you may feel uncomfortable at first giving off your belt (which happened to me at other matches). There are loads of salesmen around selling PUMAS jerseys and food and drinks. Our tickets were for the long end of the stadium, technically the main stand, though there is hardly any difference between the stands. No fixed seat numbers, so free seating on concrete benches. Pumas played Toluca, no rival, so it was easy to find a place (and get tickets). I’d say the stadium was about a third full, with the fans primarily located on both long ends and hardly any behind the goals. Also the fanatic fans seemed to have their area at the main stand, quite unusual, though the atmosphere got at no point aggressive and the crowd seemed to be more upper class than at other Mexican clubs. The crowd did seem to be very homogeneous, with practically all of them wearing PUMAS jerseys and chanting along with the more common chants. The match started with the university hymn with everyone singing along with their fist up in the air. One particular chant seemed to be the preference of most of the people. Also there was the typical Latin American salsa type of band playing along. A nice atmosphere, but nothing too exciting. Maybe the hour? As in all Latin American stadiums vendors walk round the stadium selling drinks and snacks, including beer. One word of advice: the stadium doesn’t have a roof, so when the sky is clear, which is not uncommon in Mexico City, you’re sitting full in the blistering sun and without sunscreen you’re bound to get sunburnt. Needless to say that when it’s raining you’re bound to get wet (not so common though). So take precautions or arrive very early to claim one of the few covered seats. After the match we got quickly out of the stadium without problems to take the metrobus back to central Mexico City.